Unlike many, my search for raw did not come from a dog who was having skin issues, allergies, stomach issues, etc. I simply wanted a better way of feeding my dog after I found out what was truly in the food I was feeding him. He went from Pedigree to raw and the difference was astounding. So many people have dogs with greasy coats and Dude was no different. He is no longer greasy and is just healthier in general. He lost some excess weight that didn't make him look fat but made him appear almost... puffy. 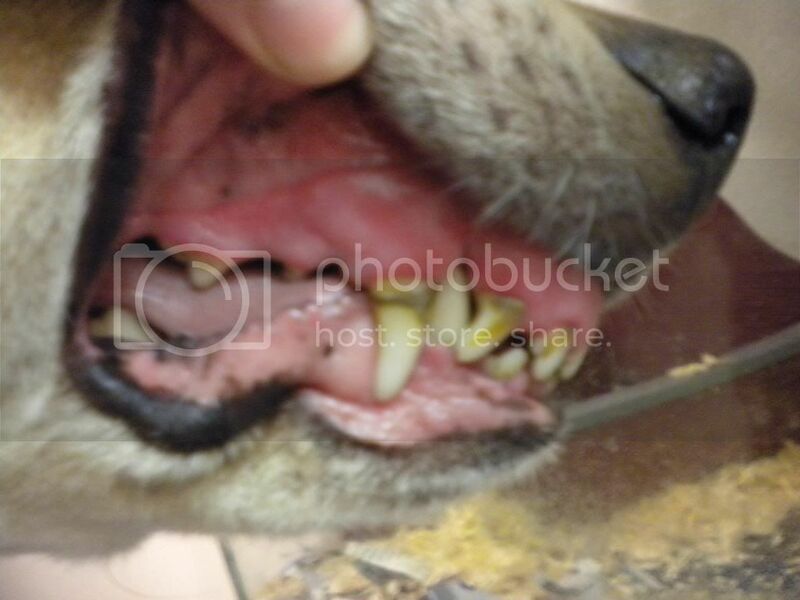 There are tons of advantages to feeding raw but the one most easily documented in my dog was his teeth. He was on Pedigree for the first 7 years of his life and had never had a dental. Where I am from, no one takes their dogs in for dentals. The thought of it is absurd. Mention it and you're likely going to be laughed at. So, because having a dog's teeth become gross and covered in plaque as they aged was normal. Just about everyone's dogs had plaque covered teeth. 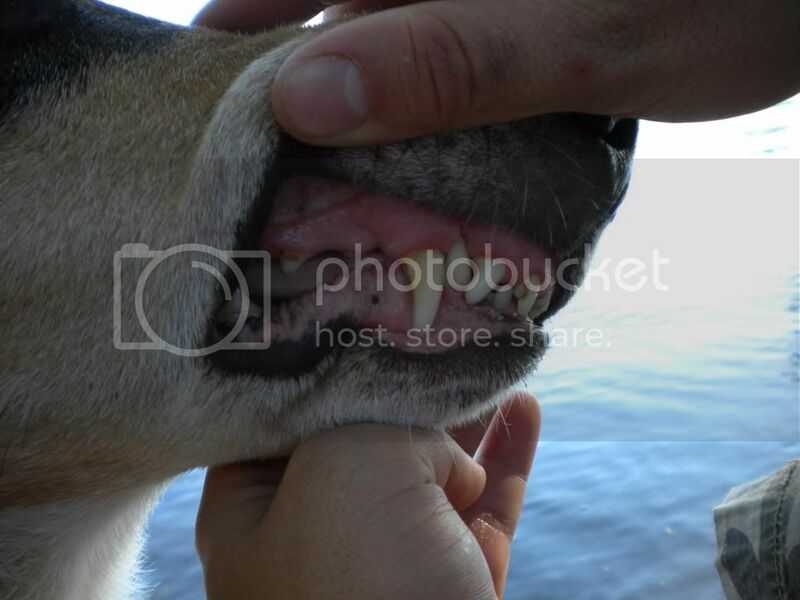 Here are Dude's teeth a few weeks before he was switched to raw. He was 7.5 years old. This was about three months in with him eating mostly chicken (difficult transition) so not many harder bones like pork, beef, or goat. Just soft poultry bones. This was another few months later. It took less than a year for his teeth to go from disgusting and plaque covered to nearly clean. They are even cleaner now. That's an amazing story!!! I love the pictures, and how well those teeth cleaned up. You definitely saved him a lot of pain and agony he would have seen later on in life. I'm going to pin this thread so that other people can add to this with their dental success stories! I wish I had taken before and after with Lucky when we got her. She was older then, and I have no idea what all she had been fed.Her teeth weren't terrible then, but not the greatest either. Now they look nice and white. It amazes me everytime I look at her teeth, because she's got to be at least ten to twelve years old now. People have commented on how clean and white Clover's teeth are, and she has only been on raw since June! I just realized that Dude's before and after pictures are like every other before and after picture advertisement. I took the first two myself so I was holding him still, holding his mouth open, AND working the camera by myself. We were at the house which had very poor lighting. We had a little cove we went to and we just happened to notice how clean his teeth were while we were there and my husband was with me so he held Dude's lips while I took the photo so it turned out much clearer. Not only that, there is a nice background of ocean water. My pictures fit the stereotype... Bad photos of the before and good pictures of the after so the whole change seems that much more glamorous. This guy's gone now, but his teeth were still pearly white at 11.5 years old. Wait, what guy is gone now? Dude. We lost him on Sunday morning. Oh hon! I am sorry you lost Dude! I really liked his thread. Awwwww, I'm so sorry! I knew that was him in the picture, but I hadn't heard about ya'll losing him. It threw me off. I'm just so sorry. Thanks. It hasn't even been a week yet. It actually feels like he's just temporarily gone. Like he's just being taken care of by a friend for a few days, but he'll be back. It's just so strange. It's funny that, back then, dogs developing brown teeth and bad breath was considered totally normal. 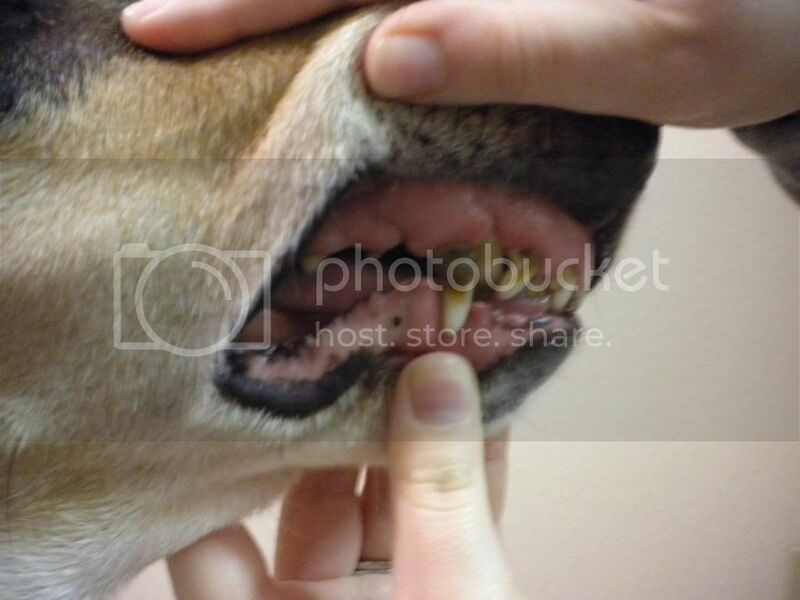 I grew up among "normal" dog owners who often have no idea dentals for dogs even exist. Now, I can't even imagine having a dog with gross teeth or bad breath. I remember our Brittany, Hoss, had such horrible breath, it could make you gag. We loved our dogs, but avoided having their faces in ours for longer than it took to give them a kiss. I don't know if it's because I am with my dogs more or because their breath doesn't stink AT ALL (unless they've JUST eaten something smelly or turkey, which seems to cling to their breath longer), but they are in our faces all the time. I am so sorry for your loss! I remember feeling the same way, that they were just temporarily staying somewhere and would come back. My TRD was confused that his Japanese Chin buddy wasn't home. Whenever the dogs came back in the house, he would look at our Boxer, me, and back at the door... like he was wondering if he was the only one who noticed Ulu wasn't there and that maybe I forgot to let him back in the house. We've had time to get used to it (a couple of years), but there definitely was a sense of loss in the house felt by everyone. It's so hard, because it's still the loss of a family member. TRDmom, I'm glad I'm not the only one who feels that weird temporary thing. It's so strange. You know, he had been confined to the linoleum floors and we had a big pen set up in the corner for when we were gone and it took up a lot of space... That whole corner is empty now and it's just such a glaring difference. Before the end of that day, though, it looked like we'd never had three dogs. We took that pen out before the crematorium even arrived to take him. His collar is put away. I erased his feeding schedule from the whiteboard. Frankly, it's been easier than having all those reminders all over the place. Being the shedder he was (especially this time of year), I still frequently find Dude hair on things (especially Iorveth's face, for some reason) no matter how many times I've vacuumed. I've hear dog other people's dogs being upset or confused about the death of another dog in the household. My Brittany searched for my Dalmatian the day we euthanized her until my mom took pity on him and let him become an indoor dog again. He forgot about searching for her pretty quickly after that. My two though... Buck had the briefest of sniffs of Dude's body before he was satisfied and Iorveth was much more interested, but both were back to business as usual and roughhousing with each other before Dude's body was even gone. They haven't been phased one bit. They are definitely MUCH closer to each other than they were to Dude. Shoot! I just lost my message! Oh well... I too remember finding dog hair for awhile after our two passed. I used to joke that our TRD shed Japanese Chin fur. Pa Gaw isn't much of a shedder, but he would collect Ulu's loose hair when they played. The two boys were best friends. When Ruya had to be put down, Pa Gaw didn't really care. She LOVED people, but tolerated the boys and other dogs. Even with their things packed away, we still have many good memories. I agree with what you said though, it looks like we never had three dogs. Everyone meshed well and things weren't crazy like many people assumed it would be. Everyone had their own spot to eat, sleep, and knew where to settle down for TV viewing or ride in the car. Now its just the one dog. He's my co-pilot, but I do miss the others. I think sniffing Dude's body helped them to understand, and they said good by in their way and sort of made peace with it. I really believe they do that. We have gone on farm calls at work to put down a horse, and the owner will walk the other horse/horses over to the body and let them sniff and say good by in their way. So, I believe it's horses as well. I think it is good for them, both dogs and horses to do that. They need to say good by and grieve in their own ways as well. Glad to hear I'm not the only one who puts things away immediately. In all honesty, I'm that person who, right now, could go puppy shopping on the internet (by which I mean researching breeders). I would have had no problem going out the day he died to pick up a new puppy. I guess I have just never been one to see a new puppy as a replacement for one lost. My stepdad is that way. He did NOT want Dude because he felt we were getting him to replace his Dalmatian (who's short, stiff hairs we found embedded in fabrics for years after she left us). I see it as, well, now I have an open spot for a new family member. We have decided, though, that since we rent and the house is small with no fenced yard, that we are going to wait until we move. It'll be at least two years, but I am okay without another puppy right now. I think it's because I finally have my heart dog (Iorveth) and just don't feel a need for another quite yet. He's sleeping pressed up against my back as I type this. Ha. With Buck, he hit 8 months and I was on the hunt for another dog. Iorveth is 2.5 years old and the need for another dog hasn't hit me like it did when I had just Dude and then Dude and Buck. Honestly, I think these two just didn't much care. He helped teach them manners as puppies, but they have each other and left Dude out of their games (much to Dude's relief). I would much rather they be able to sniff his body and know what's going on than to just disappear with a living Dude and come home without him, but I don't think they'd care then either. I don't doubt other dogs grieve and a Xolo friend said her dogs looked for her oldest Xolo for 6 months after they lost him, but mine sure didn't. There hasn't been an ounce of odd or unusual behavior around here. I prefer it that way. It's kind of sad that Dude got no "emotion" from them after he was gone, but I would much rather have dogs that go about business as usual because 1) I can rest easy knowing they aren't stressed and 2) it would make it harder for ME to watch them behave as if they didn't understand where he had gone. I think it will be a different story entirely when Buck goes. Buck's only 4 so that's a LOOONG way off yet (knock on wood), but he and Iorveth are so dang close and Iorveth just adores Buck with every fiber of his being. It's like watching a little boy idolize his older brother who occasionally gets annoyed with him.